Micron Laser Technology provides Lexan laser cutting services for consumer products, original equipment manufacturers, and printed circuit board manufacturers, as well as other customers in the aerospace, transportation, and medical industries. MLT's numerous laser machining centers are equipped to handle volumes from prototyping to long production runs. 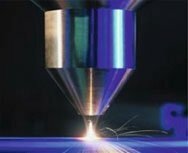 Micron Laser’s laser processes match the optimal wavelength and beam delivery to cut a variety of materials including mild steel, stainless steel, titanium, medical grade silicone, ceramics, phenolics, adhesives, precious metals, plastics, rubbers, fabrics, silicon and much more. MLT stocks a number of materials for immediate use or non-stocked materials can be procured as part of the unit pricing. Customer-owned material can be stored/stocked on-site to reduce lead times and material costs. Traditional CNC machining that uses a spindle and cutting tool for cutting. Laser machining replaces the physical router or drill bit with the laser beam itself. Traditional CNC router tools prevent sharp internal corners and have a tendency to 'throw' the part. Laser routing or contouring can create near perfect 90 degree cuts and hold very close radial tolerances. Laser produced edges are as sharp and square as your design requires. Because there is no physical contact to the part, the laser will never 'throw' the part or degrade in cut quality due to tooling wear.